Offer a variety of seeds, nuts, and fruit to your favorite birds in one convenient place with the Pine Tree Farms Fruit, Berry, and Nut Seed Bar. This compact bar easily fits into your existing Pine Tree Farms All-Season Hanging Wire Seed Bar Feeder (not included), creating a tidy feeding station virtually anywhere in your garden. Sunflower seed, corn, tree nuts, blueberries, and other dried fruits all combine in this bar for a wealth of food choices for your birds. The bar maintains its shape with gelatin, and is an excellent alternative to loose seed feeding. For more bird watching options, place the item on a tray or platform feeder. 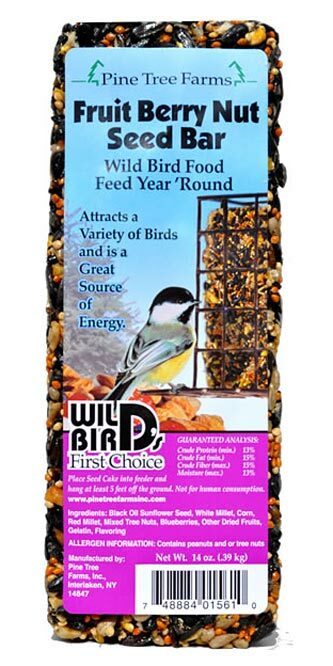 Invite a wealth of birds to dine in your yard with this Fruit, Berry, and Nut Seed Bar. Made in the USA. Note: This case pack includes 14 of the Pine Tree Farms Fruit, Berry, and Nut Seed Bars.